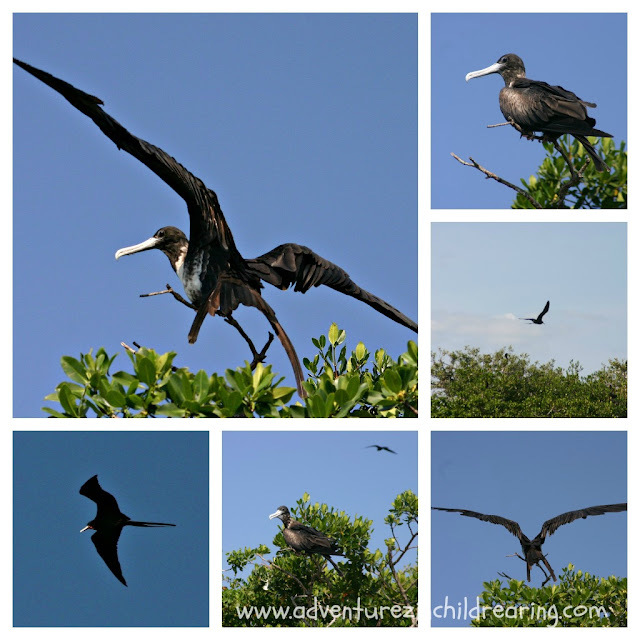 We got up close and personal with a Magnificent Frigate Bird a.k.a. "Man 'O War" back in September. These birds only come in to roost during mating season and in cases of really big storms. The one in the bottom left corner is a male. You can just make out the red on his throat. There are so many interesting facts about the frigate, we had to dig in and learn more. So, I created a unit study for us to use in our research. Get your own FREE Frigate Bird unit study below. We used various maps for each age, including the Atlas, a sticker world map, and a puzzle world map - all to locate the oceans where you will find Frigatebirds living their unique lifestyle. We measured the vast wing span, enjoyed coloring pages, learned facts and figures about these wonderful birds that will amaze you. The unit study includes bible verses, writing and cursive practice, math, spelling and more.
. . . And boy does the Frigate bird ever fly above the earth, as a matter of fact, they almost never stop flying. Night and day they glide, swoop, and fly across the waters of the ocean. The frigate is one of the most interesting species of seabirds - called Man’O War because of its habit of pirating food from other birds. The frigatebird will swoop in and attack other birds, stealing their meal. Frigates also eat jellyfish, turtles, and squid. They are a member of the Fregatidae family - genus Fregata and are related to pelicans. In some places they are called “frigate pelicans”. Frigates are known for their long wings which can span between six to eight feet. They have the longest wingspan per body weight of any other bird. They are graceful gliders and have a swallow or split tail – extremely aerodynamic. Frigates spend most of their time flying over the waters of the tropical Atlantic, and other tropical seas, coming in to roost only when it is time to mate. They spend most of their lives in the air. Frigatebirds are pelagic feeders, which means they feed on fish that are not close to shore. When fish live away from the coast, and not on the continental shelf they live in the pelagic zone also called the open-ocean. The pelagic zone is the opposite of the benthic zone which consists of animals that live on the bottom of the sea. Crabs and clams are examples of these benthos marine organisms. Experienced fishermen watch out for the frigates, which are known to track predators, such as sharks, that herd baitfish toward the surface thus making it easy to pluck a meal right out of the water, without even getting their fine feathers wet. Each year they choose one mate and the female lays a single egg with an incubation period of 55 days. Frigates nest in colonies. The male frigate has a red throat pouch which he inflates to attract a mate. Females take care of their young for about a year and so are able to mate every 2 years. The males mate annually. They spend more time caring for their young than any other species of bird. The young have to be fed and grow strong enough to be able to fly long distances high up over the water. Frigates even sleep “on the wing”. There are studies currently going on to try and learn more about their sleeping patterns. I am of the opinion that the Frigates are a marvel of God’s creation and that they point directly to a Divine Designer, who created them to fly both day and night. They actually make for a lousy sea bird because their feathers are not waterproof. Had they taken many years to evolve, too many of them would have drowned in the process making this bird an epic FAIL for evolution. They have skinny feet and legs, and therefore don’t paddle well in water or get along well on land. All of those problems would have to have been tackled at the same time in order for the Frigate to have evolved as a creature from the sea. They have been flying above the waters since God created them. What an awesome Designer He is! 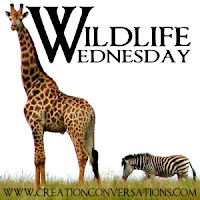 Be sure to enter your own nature studies and wildlife adventures in our ongoing link up on Adventurez in ChildRearing. Visit the Wildlife Wednesday Pinterest board, and you will definitely want to enter the December giveaway here for a copy of Marvels of Creation – Sensational Sea Creatures.